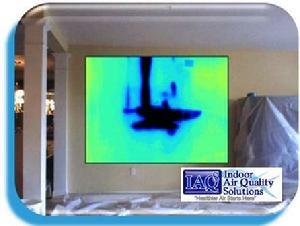 IAQ Solutions provides Infrared Thermal Imaging Inspection services for commercial and residential properties. 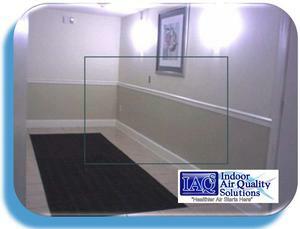 Homes, Factories, Offices, and Apartment Buildings, can be troubled by problems related to design, construction, maintenance, or emergency situation such as fire or floods. 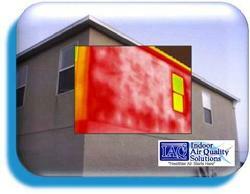 A Council-certified Environmental Thermography Consultant (CETC) investigates structural and environmental issues in the built environment using infrared thermography. 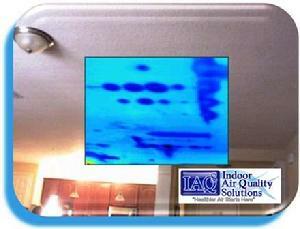 For example, a CETC can identify mold and moisture issues during a commercial investigation or a home inspection that may be invisible to the naked eye. 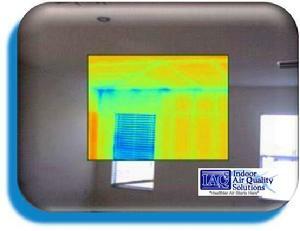 A CETC has verified knowledge of thermal and infrared physics as they apply to the building sciences. 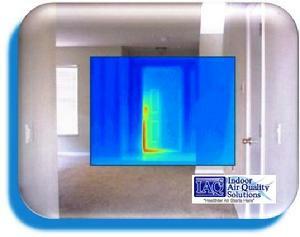 A CETC has verified knowledge of the selection, calibration and operation of thermal imaging equipment. 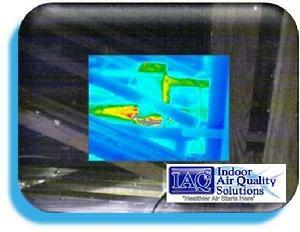 Finally, a CETC knows how to apply the principles and equipment of infrared thermography to a building investigation. 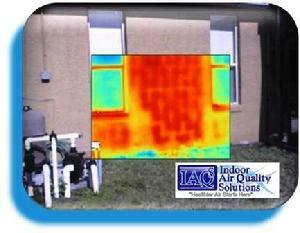 Make sure your next Infrared Thermal Imaging Inspection is conducted by a Council-certified Environmental Thermography Consultant (CETC). 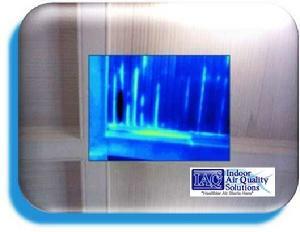 A CETC has demonstrated at least eight (8) years experience conducting field investigations involving infrared thermography. 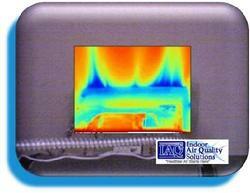 Field experience documentation is reviewed by the CETC certification board. The CETC certification is accredited by the Council for Engineering and Scientific Specialty Boards (CESB), a nationally recognized independent accreditation body. 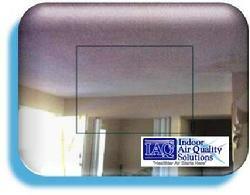 ACAC certifications are the ONLY designations in the indoor air quality field to earn CESB accreditation. 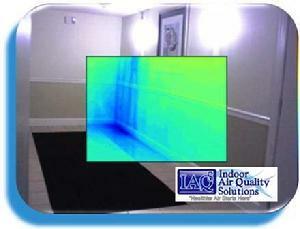 Why are Thermal / Infrared Cameras indispensable for Building Envelope & Indoor Air Quality Inspections? 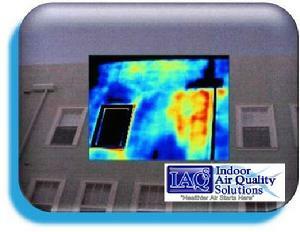 Water intrusion at failing lap siding. 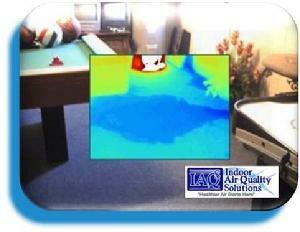 The water accumulated in the floor system of the building. 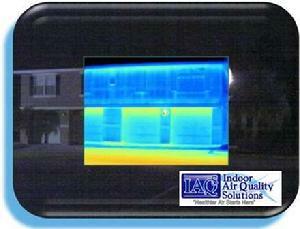 Thermography, also called Thermal Imaging, is the production of non-contact infrared or “heat” pictures from which temperature measurements can be made. 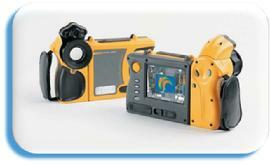 Hand held or fix-mounted infrared cameras scan equipment or structures, then instantly convert the thermal images to pictures for monitoring or quantitative temperature analysis. 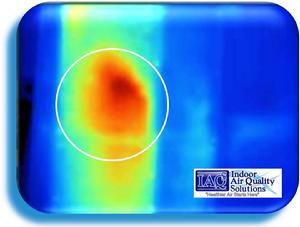 By detecting anomalies often invisible to the naked eye, thermography allows corrective action before costly system failures occur. 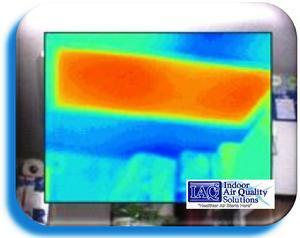 Infrared Thermography has evolved into one of the most valuable diagnostic tools for Predictive Maintenance and many other applications. 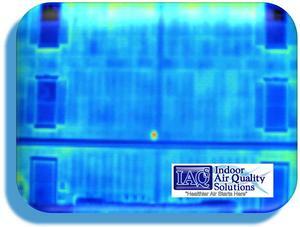 It maximizes operations and safety in many industrial environments, but it also increases building efficiency. 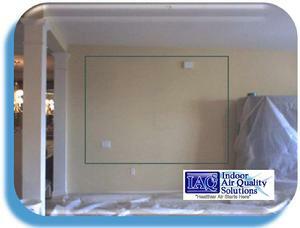 It is the most economical way to discover construction failures and to communicate them. 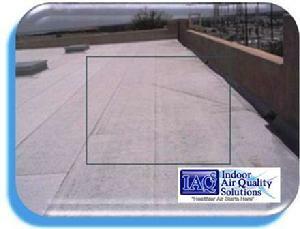 Water leakage is the leading cause of roof damage. 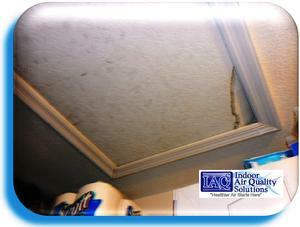 It ruins insulation, causes corrosion, weakens metal decks and other building structures, encourages mold growth, and can even lead to structural collapse. 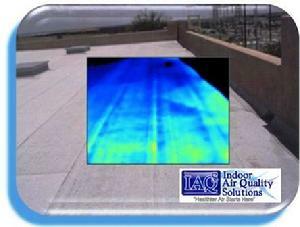 But thanks to infrared surveys, there's now an fast, effective way to spot water accumulation and damage on any roof-even when that damage is out of sight. 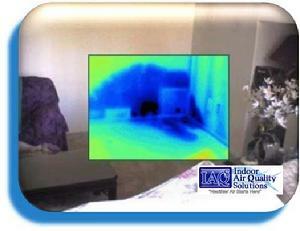 FLIR infrared cameras instantly show you what's wet and what's dry. 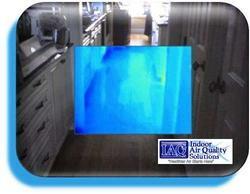 You can immediately locate the ultimate source without disassembling the premises or disrupting the inhabitants. 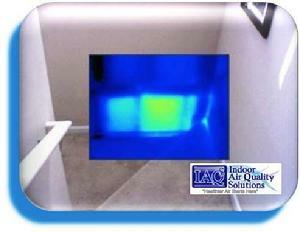 Heating, ventilation, air conditioning costs have doubled over the last years and they will not drop spectacularly in the near future. Legislation pushes the implementation of energy-saving construction technology, materials and appliances for both residential and commercial buildings. 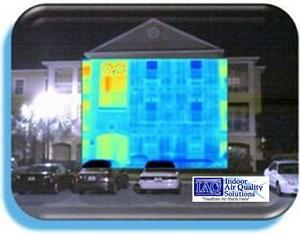 What has this to do with infrared thermography? 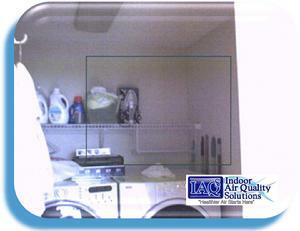 The major advantage of infrared cameras is that they image and measure entire surfaces and provide clear images that can be stored, sent and analyzed. 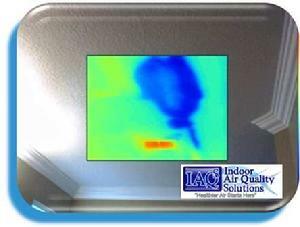 IAQ Solutions utilizes infrared cameras with special measurement features for building diagnostics which enable easy detection of building anomalies that often result into energy losses. 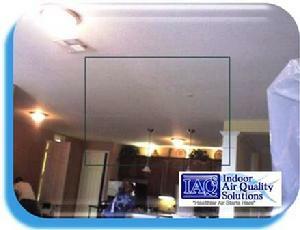 Such cameras eliminate costly inspection techniques that require labor, time and destructive probing. 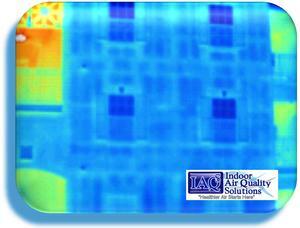 Finding and repairing faulted areas thanks to infrared thermography saves energy resources, time, money and last but not least, provides a rapid return of investment on the infrared survey. 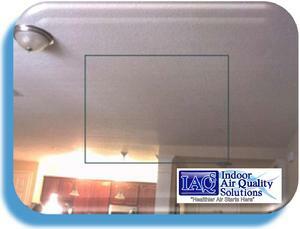 Hidden water above ceiling unidentified in the photo above. 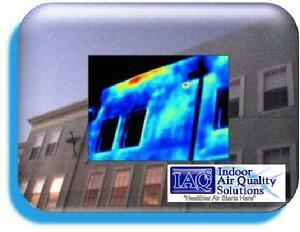 The building is an asset that is to be preserved or improved. 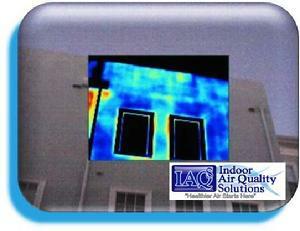 Against this background, it is imperative to be able to assess and value the building substance thoroughly and quickly. 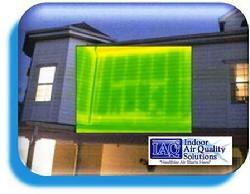 Infrared building diagnostics caters to the private house owner as well as to investment companies owning huge real estate units and employing or outsourcing a huge facility management staff. 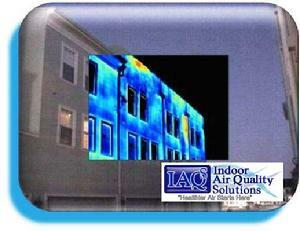 Clear infrared images of normally invisible diagnostic evidence carry invaluable information prior to far-reaching decision-making, ranging from the costly roofing or façade repair of a row house to major investment project decisions. 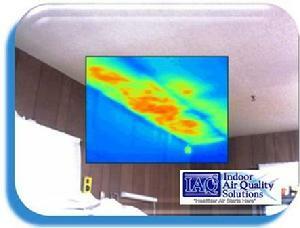 Building inspection data gathered by an infrared camera provide convincing evidence in property damage settlements. 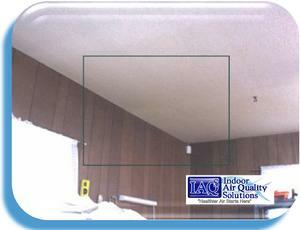 In addition, regular inspection of the building and its facilities allows the insured party often to obtain a substantial discount on the insurance contract. Planning, control, supervision and documentation of the works becomes an important issue as the building sector is faced with new materials, a growing set of building regulations, ever-shorter time frames to get the job done and, in some regions, lack of a skilled workforce. 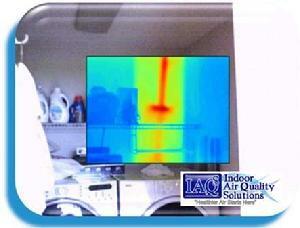 The infrared camera enables to clearly document repair, restoration, insulation or HVAC works. 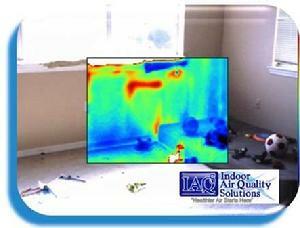 Thermal images show customers and clients the exact problem and prove to them that the problem has been repaired correctly. 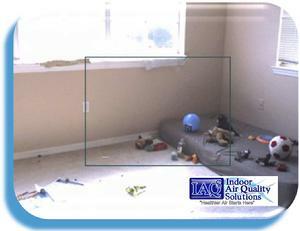 This evidence adds value to the contractor’s skill and expertise. 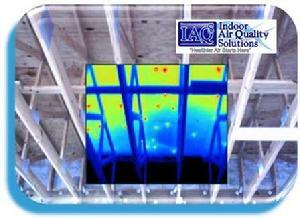 Moreover, to serve the above-mentioned groups, the infrared camera expands the range of services offered by building sector specialists. 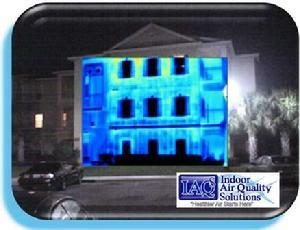 Using a building applications infrared camera before every building valuation, transaction, or major HAVC repair maximizes value and minimizes costs. 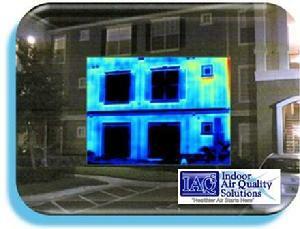 What can be done with an infrared camera? 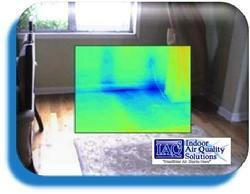 Trapped water identified under wood flooring from a Cat 3 Leak in an adjoining powder bath. 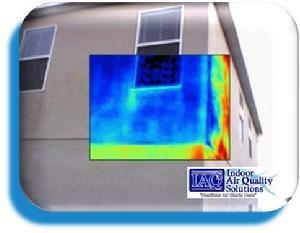 Water infiltration in a poor stucco application. 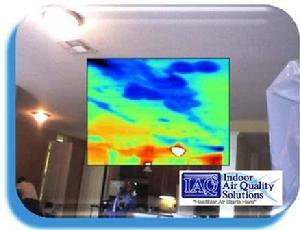 The cracks and areas of water intrusion are visible with the thermal camera. 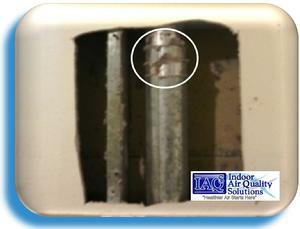 Air leaking from a supply plenum. 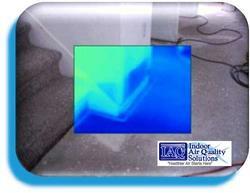 Water in carpeting from leaking exterior door on the other side of the room. 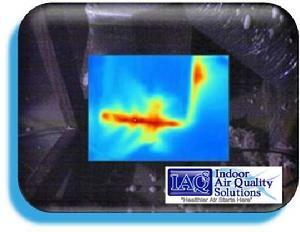 This temperature differential was reported by a �Camera Owner� as water intrusion due to roof failure. 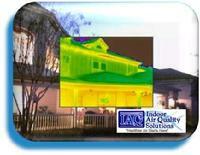 This is my thermal image of the area. 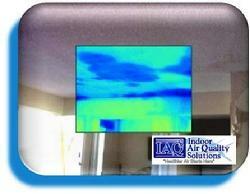 This temperature differential was actually the built up area of the roof that directs water to the scuppers. 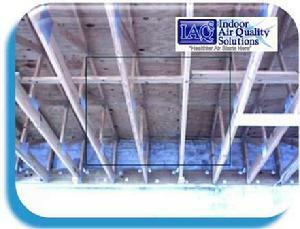 The roof sheathing was not wet when checked with a moisture meter. 4th Floor water leak in the ceiling of the 3rd Floor. 4th Floor water leak in the wall of the 3rd Floor. 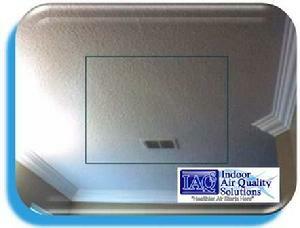 4th Floor water leak in the ceiling of the 2nd Floor.